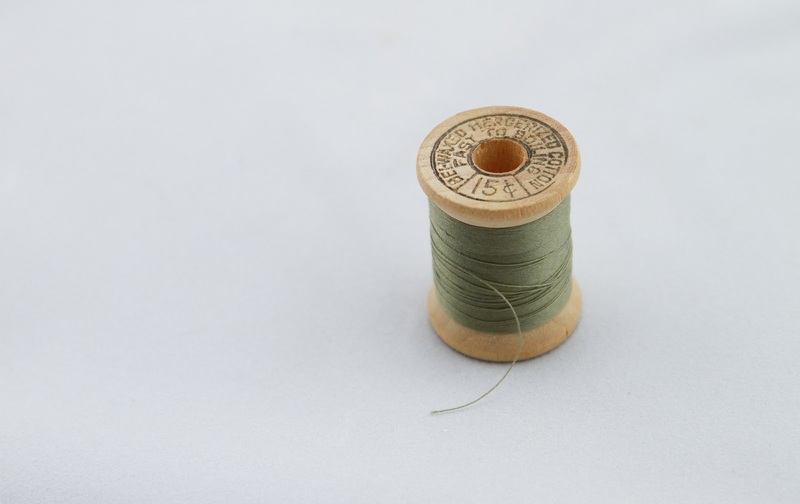 If you're fairly new to sewing, or if you've been sewing a while but are still a bit of a novice, you may have heard about the risks of sewing with old thread - that sewing with old thread can mess up your sewing machine - that clothes made with vintage thread you make may fall apart - that kind of thing. 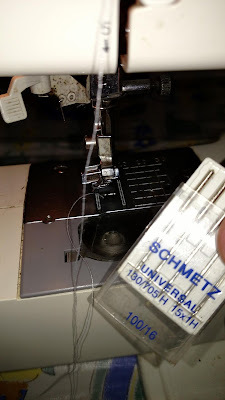 Well, those things can happen, so I wanted to share a bit about how to tell if vintage thread is too old to use. Thread used to come on wooden spools, until about the mid-1970's. Since then, it's been wound on platic and hard foam spools, so if you're looking at a length of thread wound around a wooden spool, it's probably been there a while. Can You Use Vintage Thread Or Not? Does that mean you can't use old thread? 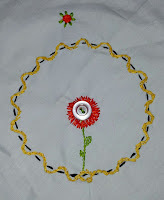 Some people will say don't use it at all - to just glue the old spools to some craft project - and that's cool if the idea interrests you - but it isn't necesssary - old thread can be used for certain things. 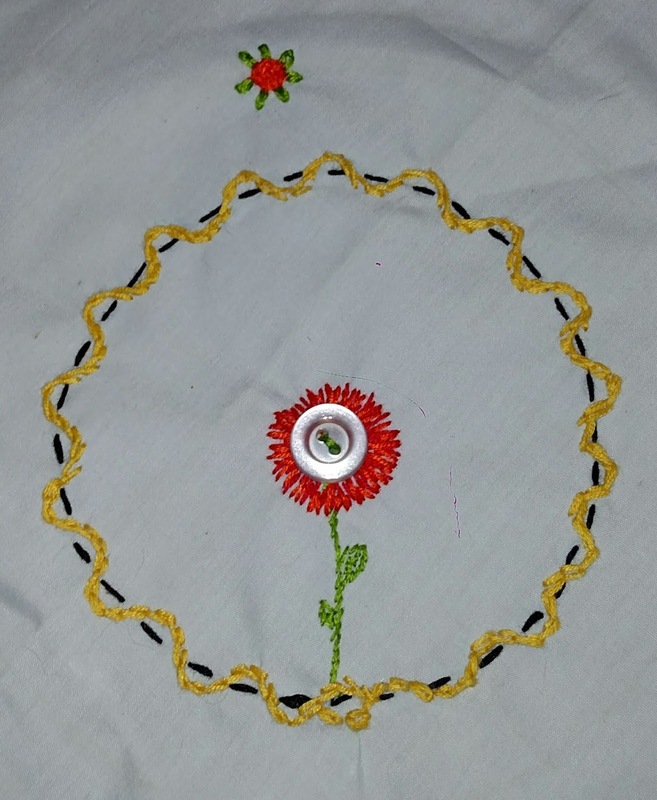 Ideally, once thread is that old, it should only be used for certain things, such as crafts that don't take any abuse. How Do I Know If Old Thread I Safe to Use? While this isn't a very scientific way to test vintage thread for tensile strength, pulling on it is one of the easiest, fastest ways to find out how strong it is. Basically, if you're sewing clothes, you don't want to use thread that's likely to break and leave you exposed. When I filmed this, I was getting ready to sew a crotch, inner thigh area, outer thigh area and hip area on a pair of uniform pants for a mechanic, so I wanted to be sure the thread i used was going to helpd up to some heavy movement and strain. 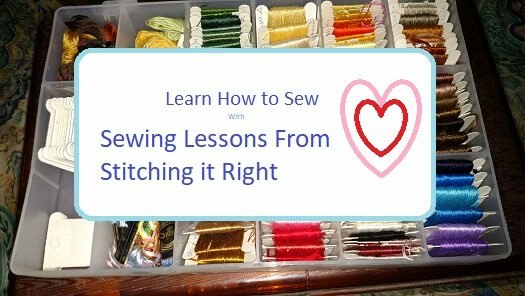 Thanks for visiting Stitching it Right, if you're interested in learning how to sew, it would be so great if you watch the video and click the YouTube "Subscribe" button and notification bell icon for Sewing Lessons From Stitching it Right. Fabric glue can be a real time saver when you need to quickly mend a hole in something, but it can be tricky to apply properly, so I wanted to share a bit of information about it. 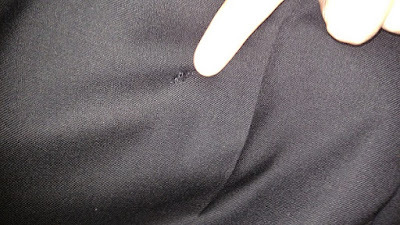 I also would like to share a bit about my experience with applying fabric adhesive to patch a small hole in a pair of dress slacks, which I documented in the YouTube video shared near the end of this article. 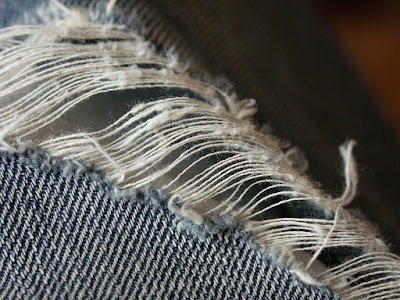 Basically, fabric glue can be permanent or semi-permanent. Temporary repairs: If you're trying to mend something you plan to properly fix later, look for semi-permanent fabric glue. It may be labeled semi-permanent or the label may mention that it washes out. 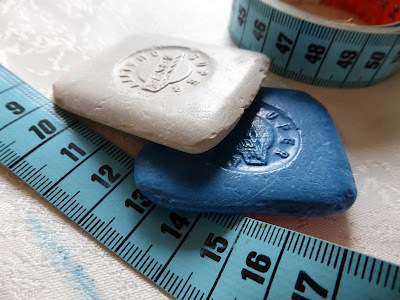 Repairs that last: If you're using fabric glue as a final repair, or if it's in a spot you don't want to risk tearing out at an inopportune moment, look specifically for the word permanent on the label. Applying fabric adhesive is fairly simple if the place you're putting it is easy to access. In the video below, I'm applying it to the inner layer of lined dress slacks, which made it fairly complicated. Make sure the fabric and patch are both clean and as free of frayed threads as possible. Use an artist's paintbrush or cotton swab to apply the fabric glue so you can put it neatly where you need it to be. 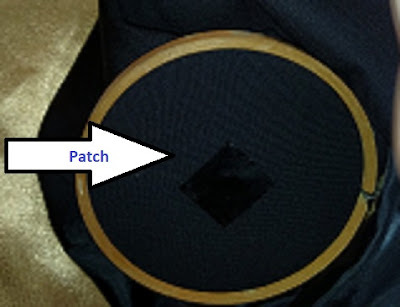 Try to only apply the fabric glue where the patch will be placed because it can leave a shiny, coarse surface if it's exposed, plus it's more likely to peel if it sticks out from under the patch. Apply a heavy coat of fabric adhesive, it may seem like you're just drenching the fabric with this glue, but it's more likely to bond well if you apply a thick coat of adhesive. 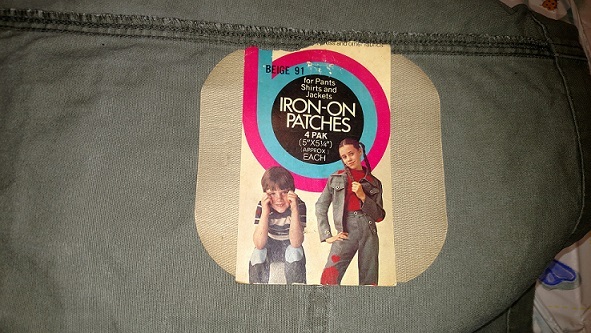 Check the label of the glue, fabric, and patch to make sure they're compatible. Some fibers simply won't bind well with fabric glue no matter how much you apply or how careful you are when applying a patch with fabric glue. With the pants in the pants in the video, I didn't apply nearly enough fabric glue, but I did also do some hand sewing to mend the hole. 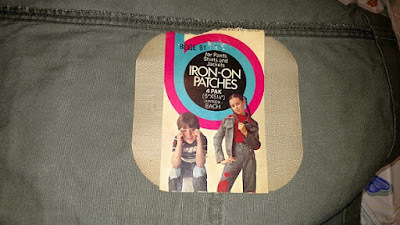 The glued patch stayed very well on one side, but it was loose on the other. 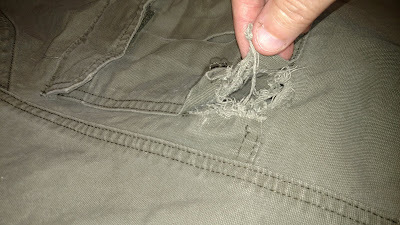 I could have reglued it, of course, but I was already planning to sew the frayed ends and the parts that did stick well added enough strength to the pants that there was no worry of the hole getting bigger any time soon. Here's a link to fabric glue on eBay in case you're interested in finding deals on this product. Stitching it Right is honored to partner with Village Bakery to bring you this post about how to make a yummy muffin gift basket. When you're looking for a great, thoughtful gift, maybe a muffin gift basket would be a good choice. After all, muffins are tasty, baskets are pretty, and if you stitch up a little basket liner to put in the basket, it makes it look even cuter. It also gives the recipient a way to temporarily cover up the muffins when she or he isn’t eating them. Get started by choosing a basket the size you’re thinking of giving. Keep in mind that a really big basket, while it may look cool and exciting, can mean a LOT more time baking, plus, if the recipient doesn’t have a large family, the muffins may go stale before they get eaten. A basket that’s big enough to hold six to twelve muffins or twelve to twenty-four mini-muffins is usually ideal. Make sure the basket is clean inside and out. Put a layer of plastic wrap, parchment paper, or waxed paper in the bottom to help keep food particles out of the basket’s weave. 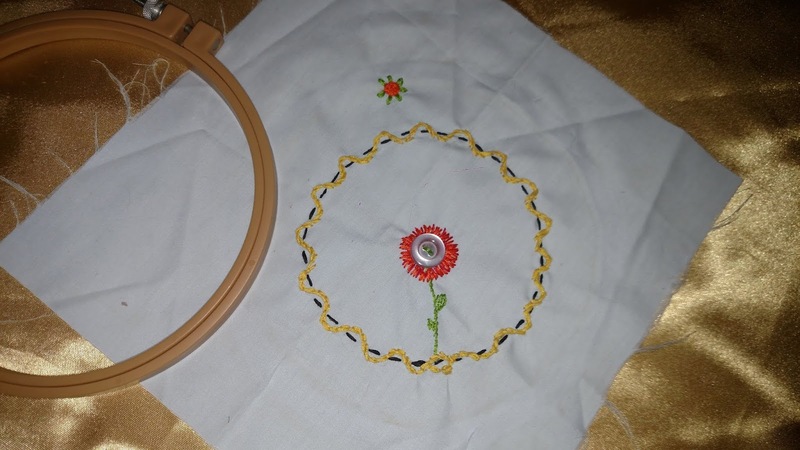 Take a large bandanna or piece of fabric and lay it in the bottom of the basket. Press it down in, to line the entire bottom of the basket with the edges of the fabric hanging over. The excess fabric will fold over the muffins for a pretty cover. Use a needle and thread to sew small pieces of ribbon onto the liner right where the handles of the basket are - this will let you tie the liner to the basket so it doesn't shift around after you put in the muffins. Gather your ingredients and your baking supplies, including mixing bowls, a mixing spoon, a hand mixer, muffin tins, and muffin papers. Combine the wet ingredients in one small mixing bowl and the dry ingredients in a larger mixing bowl. Pour the wet mixture over the dry ingredients and stir just long enough that the dry ingredients are coated, but still lumpy. Let the muffins cool before loading your gift basket and presenting your friend or loved one with your DIY muffin gift basket. Thank you for visiting Stitching it Right! Comments are always welcome here and on our Facebook page, and if you're interested in learning how to sew, it would be great if you subscribe to our Sewing Lessons from Stitching it Right YouTube channel. When you're planning a vacation in Scranton, there's a lot to get ready. You have to come up a with some sort of schedule or itinerary that includes something for everyone. You have to plan out what to wear and which necessities to pack. If you sew, you may even want to stitch up a few new outfits or a new swimsuit. 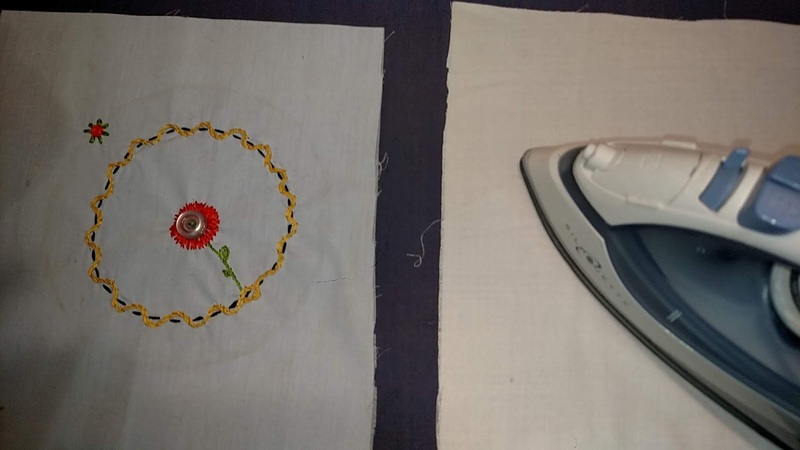 So, because this is a sewing website, I wanted to mention a few fun things to do in Scranton, and suggest an idea or two you can sew up in a jiffy to wear while enjoying your Scranton vacation. There are a variety of fun and interesting things to do in the Scranton area when you travel there for a vacation. Historic Sites and Museums: There are a number of great historic venues and museums in Scranton. Places like the Electric City Trolley Station and museum, the Pennsylvania Anthracite Museum, and the Steamtown National Historic Site all give you a sense of the area's history and culture. For these destinations, you'll want comfortable clothes and shoes. If you're stitching up a special outfit to wear visiting historic sites, choose comfy shorts in summer or slacks in winter. Be sure to pack a light jacket, too, in case the weather changes while you're out. Vineyards and Wineries: If you enjoy sipping wine and nibbling on small plate foods, you may want to visit one of Scranton's vineyards or wineries. Enjoy the views at the Capra Collina Vineyard, the Ferrona Family Winery, or enjoy a traditional wine tasting session at Bartolai Winery. Choose comfortable outfits for this type of destination, though consider sticking to business casual. If you feel like sewing up an outfit for a trip to the winery, consider a simple sundress or dress short and slacks with simple, classic lines. Resorts and Spas: In the mood for some pampering? Consider heading to a spa or resort like Montage Mountain Resorts. The resort is only open in winter, so think skiing and pack warm. If you want to make an outfit for this type of outing, consider making some simple fleece scarves, a warm polar fleece hat with face covering mask, or insulated leggings. You'll want to be layered up and warm when you head out to enjoy the winter activities. 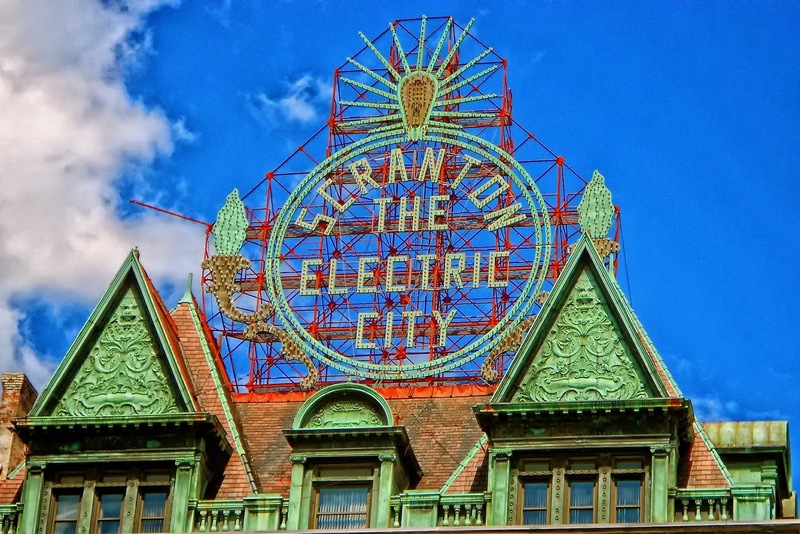 Scranton Nightlife: There are so many great places to visit in the evening in Scranton. Whether you're in the mood for a traditional pub with a rowdy, earthy quality or an upscale venue where you can wear your best clothes and dance the night away, there's something for you in the Scranton nightlife scene. The type of club you choose to visit can help you decide what type of outfit to wear. A casual pub is perfect for a casual outfit while an upscale club is a great place to wear a cocktail dress or dressy outfit. I tried to pick some thigns that are suitable for kids and some that are more adult-themed for this piece about things to do when you're vacationing in Scranton. Historic and outdoor activities are a fun way for families to spend an afternoon, and enjoying Scranton's nightlife scene or visiting wineries is a fun way for adults to relax in the city. If you've been to Scranton, or would like to share your ideas on my choices, comments are welcome here or in the Facebook Stitching it Right Sewing Talk group.